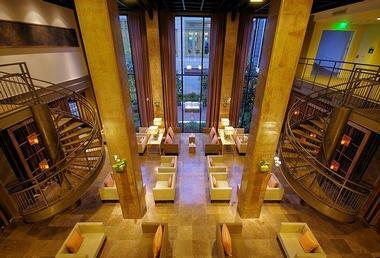 The Proximity Hotel is an award-winning LEED-certified hotel in the heart of Greensboro, NC. The 147-room hotel is surrounded by beautiful flowering gardens with a stream and features first-class facilities including a swimming pool and outdoor terrace, a fitness center, and free loaner bikes for exploring. 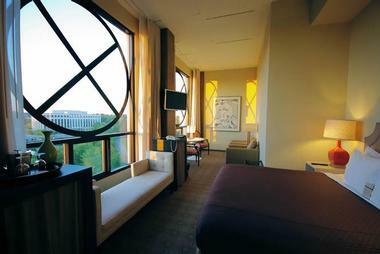 The AAA Four Diamond hotel combines innovative design and creature comforts to create a stylish haven in which to unwind. The hotel boasts a designer lobby, a European bistro-bar, custom-designed décor, and striking artworks and supports sustainable and eco-friendly practices. The Proximity Hotel is just nine miles from Piedmont Triad International Airport and offers complimentary shuttle services to and from the airport. The Proximity Hotel features 147 well-appointed designer guest rooms and suites with high ceilings, large windows and ample space for comfortable holiday living. Rooms are flooded with natural light and are furnished with locally designed décor and commissioned artworks. Guest rooms differ in size and layout, however, all enjoy standard amenities, including designer Magi beds with Italian-woven sheets, Egyptian combed-cotton, and down-like sleeping pillows, private bathrooms with makeup mirrors, hairdryers, plush bathrobes and AVEDA bath products. Rooms also include 32” flat panel televisions with cable channels, sound systems with CD players and MP3 connections, dual telephones phone lines with direct dial access and voicemail, coffee makers, mini-refrigerators, microwaves, and complimentary high-speed Internet. Exceptional guest services range from daily delivery of the New York Times delivered and in-room dining from the Print Works Bistro. Loft King Corner Rooms and Loft King Center Room feature Magi King beds with Italian-woven sheets, Egyptian combed-cotton, and down-like sleeping pillows, and spacious private bathrooms with double vanities, showers/baths, makeup mirrors, hairdryers, plush bathrobes and AVEDA bath products. 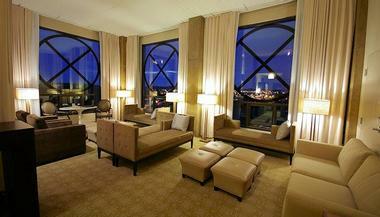 Spacious sitting areas have designer furnishings, beautiful artworks and large windows with stunning views. Loft King Spa Rooms offer extra space and privacy with Magi King beds with Italian-woven sheets, Egyptian combed-cotton, and down-like sleeping pillows. Private bathrooms have walk-in glass showers and separate soaking bathtubs, double vanities, makeup mirrors, hairdryers, plush bathrobes and AVEDA bath products. Loft King Spa Rooms also include 32” flat panel televisions with cable channels, sound systems with CD players and MP3 connections, dual telephones phone lines with direct dial access and voicemail, coffee makers, mini-refrigerators, microwaves, and complimentary high-speed Internet. Exceptional guest services range from daily delivery of the New York Times delivered and in-room dining from the Print Works Bistro. Loft Double Queen Rooms feature two Magi Queen beds, with Italian-woven sheets, Egyptian combed-cotton, and down-like sleeping pillows, and spacious private bathrooms with double vanities, showers/baths, makeup mirrors, hairdryers, plush bathrobes and AVEDA bath products. Additional amenities include 32” flat panel televisions with cable channels, sound systems with CD players and MP3 connections, dual telephones phone lines with direct dial access and voicemail, coffee makers, mini-refrigerators, microwaves, and complimentary high-speed Internet. The One-Bedroom Studio Suite is perfect for guests wanting extra space and style for intimate gatherings or family getaways. This suite features spacious, naturally-lit living areas with large windows and cozy bedrooms with Magi King beds with Italian-woven sheets, Egyptian combed-cotton, and down-like sleeping pillows. Two full bathrooms feature soaking bathtubs and walk-in glass showers, makeup mirrors, hairdryers, plush bathrobes and AVEDA bath products. Additional room amenities include 32” flat panel televisions with cable channels, sound systems with CD players and MP3 connections, dual telephones phone lines with direct dial access and voicemail, coffee makers, mini-refrigerators, microwaves, and complimentary high-speed Internet. Located on the corner of the highest floor of the hotel, One-Bedroom City Suites are spacious and elegant and large floor-to-ceiling windows that embrace spectacular views. These loft-style suites feature open plan living rooms with comfortable seating, custom-designed décor, and original artworks, while separate bedrooms have Magi King beds with Italian-woven sheets, Egyptian combed-cotton, and down-like sleeping pillows. Two full bathrooms feature soaking bathtubs and walk-in glass showers, makeup mirrors, hairdryers, plush bathrobes and AVEDA bath products. Additional room amenities include 32” flat panel televisions with cable channels, sound systems with CD players and MP3 connections, dual telephones phone lines with direct dial access and voicemail, coffee makers, mini-refrigerators, microwaves, and complimentary high-speed Internet. The Proximity Hotel’s restaurant, Print Works Bistro, serves an innovative menu of traditional European bistro dishes with a modern twist in an elegant setting. Made from locally sourced ingredients, the menu is accompanied by an extensive beverage list that features craft and imported beers, fine wines and handcrafted cocktails. The restaurant’s interior is flooded with natural light from seven-foot-tall windows which offer stunning views of the gardens. A lovely outdoor terrace overlooks the tinkling stream, offering the perfect spot for sundowners or alfresco meals. 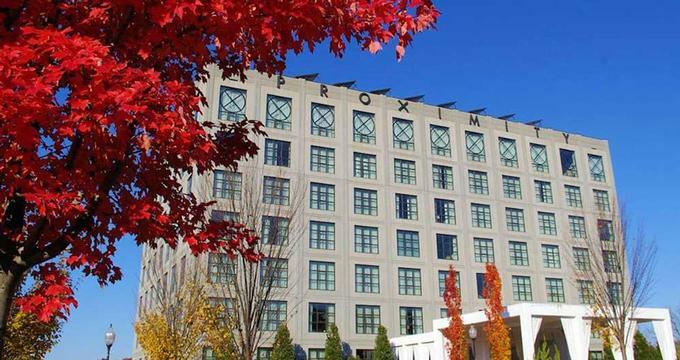 The Proximity Hotel features first-class amenities, ranging from designer interior spaces a European bistro-bar and award-winning restaurant to mini-business centers on every floor, a complimentary gym, and outdoor swimming pool. Loaner bikes are available for exploring the city and free airport shuttle transfers are offered. 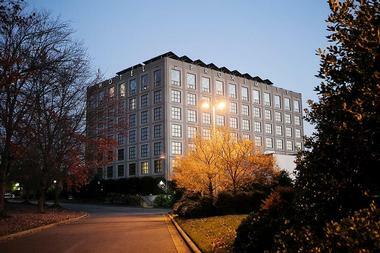 The hotel also features 7,000 square feet of event and function space, and a designer hotel lobby adorned with original artworks and sculptures. 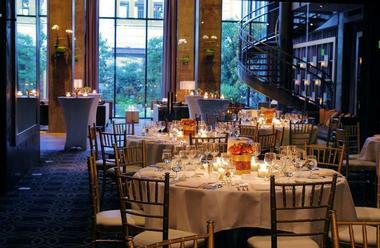 The Proximity Hotel is a perfect fit for special occasions and corporate retreats. From intimate one-day meetings or large corporate functions to weddings, receptions, and birthdays, the hotel has versatile event and banquet spaces to cater for every need. Meeting spaces feature natural light, flexible seating and are equipped with state-of-the-art LCD projectors, projection screens, and wireless high-speed Internet. Wedding packages include flexible seating arrangements, tables chairs, linens, china, glassware, candles, new house floral centerpieces, and stage and dance floor (on request), as well as set-up and clean-up of the event.